As representatives of an organization that represents the collective voices of 53,000 teachers, we take issue with the image selected for the November 3 edition of Time. We believe that the image is journalistically irresponsible and unfairly paints teachers and teacher tenure in a negative light. 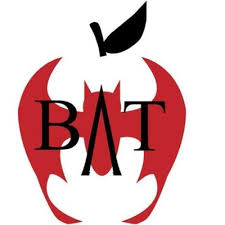 The gavel smashing the apple, the universal symbol of education, reinforces the text that applauds“tech millionaires” in finally figuring out how to deal the deathblow to teacher tenure widely misunderstood as job protection for life for teachers. In addition, the cover perpetuates the myth of the “bad” teacher and tenure as the prime enablers of larger failures in American education—more borne of structural inequalities and chronic underfunding than teaching professionals. “Labeling of teachers is hurtful and stigmatizing to teachers, students, and communities”, states Aixa Rodriguez, BAT DREAM Manager and Bronx teacher. The cover deliberately privileges the “bad” teacher narrative with the misleading statement, “It is nearly impossible to fire bad teachers.” A few months ago talk show host Whoopi Goldberg made similar statements suffering under the same basic misunderstanding of teacher tenure as something akin to what college professors enjoy rather than a simple guarantee of procedural due process which is its function in K-12 education. In fact, teacher tenure has served as an important protection to allow teachers to advocate for students— especially with regard to maintaining manageable class sizes, safe instructional spaces, ELL and Special needs interventions, and needed financial resources to combat the poverty and inequality that plague public schools and are most to blame for hurting young people. Given the massive increase in student enrollments, one of the greatest shortfalls is in the number of teachers themselves. A simple accounting of all the teaching positions lost in the great recessions reveals that the nation would need 377,000 more teachers in the classroom just to keep pace not to mention combat the shameful shortage being teachers of color. When TIME magazine decided to put out a front page depicting a gavel smashing a shiny red apple, with the tag line “Rotten Apples – it’s nearly impossible to fire a bad teacher: Some tech millionaires may have found a way to change that” they really didn’t think for one minute teachers would sit by and let that go unchallenged, surely? Click here to thunderclap TIME to tell them you want an apology. US teachers have a battle on their hands right now, regarding tenure. Tenure gives teachers the right to due process if they are being disciplines or faced with being let go. It is not a job for life – it’s merely protection from being sacked at the whim of your employer, without any good reason. You’d think that wasn’t too much to ask in any job? If an employee is not suitable, then you can show that and they can be let go. Fair enough. But you can’t sack someone just because it takes your fancy, or because they disagree with your politics, or because they spoke out. This is what’s going on in the USA, and this is why there is a push to ‘reform’ tenure – and by reform, I mean remove it so that teachers can be sacked without due process. And in New Zealand we are not exempt, small changes here and there in our labour laws, small changes here and there to the Education Act allowing untrained teachers, proposals to have a code of conduct for teachers that expressly states we cannot speak out about our employer (our school, the government, both?). The Global Education Reform Movement (GERM) is on a mission worldwide, and it’s teachers they have in their sights now. Tell TIME not to fall for it and to stop sharing GERMers’ lies. This edited version of the cover is more truthful. In just the last 36 hours, more than 30,000 people have signed our petition demanding that Time magazine apologize for its offensive cover. Next week, we’ll be delivering every petition we collect to Time’s headquarters in New York. Our goal is that they never again try to make money by attacking educators. First, we need to make sure they hear our message loud and clear. Will you help by sharing the petition and asking your friends and family to sign? 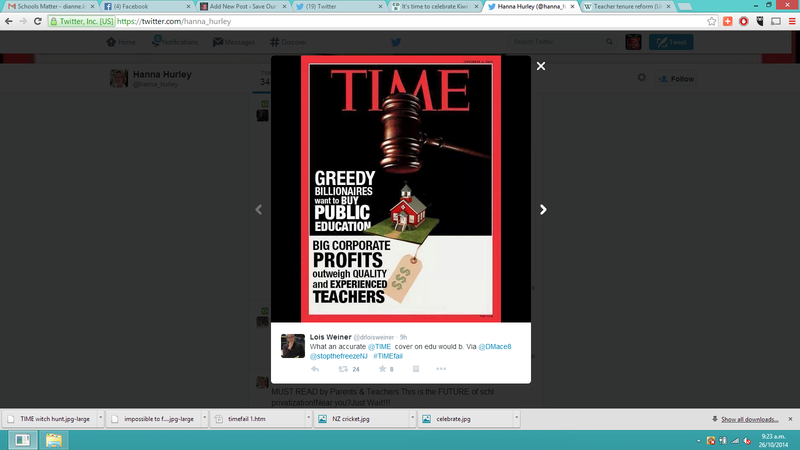 Time’s cover suggests that teachers are a problem that must be smashed. We know this image is far out of step with how Americans view our educators. I hope you’ll share the petition with your friends so we can show Time that people don’t think highly of bashing teachers to sell magazines. Sent to Time Magazine, Oct. 23, 2014. “Unassuming” tycoon David Welch is also unformed. He claims he prefers a world of “concrete facts” but still maintains that the American education system is “failing” because of bad teachers who can’t be fired. The concrete facts are these: When researchers control for the effects of poverty, American students score near the top of the world on international tests. Our unspectacular (but not horrible) performance on tests is because of our high child poverty rate, about 23%, second highest among 34 economically advanced countries, according to UNICEF. High-scoring countries such as Finland have a child poverty rate of about 5%. Poverty means, among other things, poor nutrition, lack of health care, and little access to books. All of these have powerful negative effects on school performance. The best teaching in the world has little effect when students are hungry, ill, and have little or nothing to read. Our main problem is not teaching quality, unions, or the rules for due process. The main problem is poverty. Child Poverty: UNICEF Innocenti Research Centre 2012, ‘Measuring Child Poverty: New league tables of child poverty in the world’s rich countries’, Innocenti Report Card 10, UNICEF Innocenti Research Centre, Florence.